In the March’s 2017 edition of the magazine ««Bulletin. 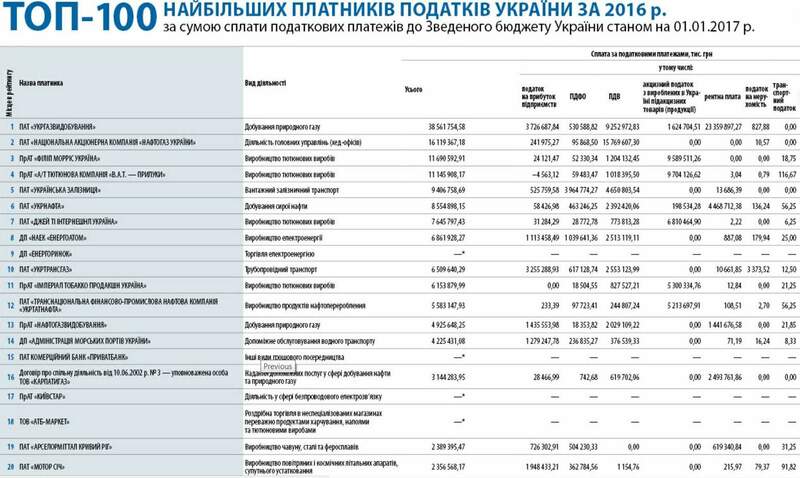 Ranks» No.1-2, published with the support of the State Fiscal Service of Ukraine there was announced a list of the largest taxpayers as per contributions made to the Consolidated budget of Ukraine as of 01.07.2017. In 2016, within the scope of Joint Activity Agreement No. 3 dated 10.06.2002 - authorized person Karpatygaz LLC, there were paid over UAH 3.144 billion taxes to the state budget, which corresponds to the 16th position in the national rating TOP-100 taxpayers. In particular, there were paid UAH 28.466 million of income tax, UAH 619.702 million of value added tax and UAH 2.494 billion of subsoil charge. . Analysis TOP-100 gives us reason to say that the development and profitable operation of energy companies is important not only in terms of improving energy security, but also to ensure the implementation of fiscal policy, particularly in the part of sustaining the budget revenues of Ukraine. Thus the TOP-50 companies in oil and gas industry, among which JAA No. 3 holds the 5th place, paid to the consolidated budget almost UAH 70 billion. Please be reminded that according to the data of SFA of Ukraine as of 01.07.2016, in the general list of the Top-100 largest taxpayers in Ukraine JAA No. 3 was in the top 20 largest taxpayers with the 17-th place, and in the list of TOP-50 largest taxpayers in Oil&Gas Industry JAA No.3 was in the top 10-th with the rank No.7 having paid UAH 1.62 billion of taxes in H1 2016. According to the rank TOP-100 taxpayers for 2015 JAA No. 3 was on the 10-th place having paid UAH 4.1 billion. Moreover, in September 2015 on the occasion of celebration of the Entrepreneur’s Day, the Main Department of SFS of Ukraine in Kyiv city honored Karpatygaz LLC as the authorized representative of JAA No. 3 dated 10.06.2002 with a gratitude for significant input into the development of entrepreneurship, contributions to the budgets of all levels and high tax culture.